Resort Style Beach House: Beach View/Large Heated Pool & Hot Tub/Twister Pool Slide/Basketball Court/Table Games!Completely remodeled January 2018! Brand new pool, hot tub and basketball court installed January 2018!This property is 6 bedrooms/5 Bathrooms, sleeps 25 people and allows up to 2 pets. All new floors and brand new quartz countertops! All bedrooms have flat screen TV's! 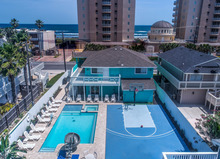 This one of a kind resort style beach house in South Padres Island that features the following amenities:-Great Beach View, Across from Beach, 200 steps to beach, near handicap beach access #17-The newly built heated pool is the largest on South Padre Island, for a single family house. The pool features an 8 person hot tub, submerged tanning area, water slide, basketball hoop and newly installed travertine pool decking. This house has unobstructed sunlight all hours of the day, perfect for sun tanning! Guests will enjoy their time in this tropical backyard.Something that makes this home a one of a kind rental house, is the the backyard Basketball Court with a professional size Mammoth 72, in ground, tempered glass basketball hoop. The home offers a great outside sitting area with a dual propane and bbq grill. The Basketball court and swimming pool area is ideal for large group team activities, birthday party, wedding event, Quinceaeras and more! The home entails all new furniture, TV's and, stainless steel appliances 6 parking spaces for guests vehicles, and public parking available nearby if needed. The 2nd floor balcony is large and wraps around the north and west side of the home. Guests can easily move to the backyard from upstairs also by accessing the exterior stair access from the 2nd floor balcony to the 1st floor patio and pool. This offers multiple ways to reach the great amenities the backyard has to offer. Quartz on all kitchen and bathroom countertops. Ample seating is provided as well with a 12 seat dining room table, great for accommodating large groups for dining and meetings. There is plenty of outdoor seating available including a dining set table and lots of lounge chairs by the pool for guests to relax.This home also features the following games; pool table, air hockey table, and a mini foosball table!Make your reservation today for this great South Padre Island vacation rental!